Vincent Van Gogh is someone who lived his life intensely and Hermann has captured this. Whether he is roaming the countryside in boots that need to be fortified with cardboard or living in a filthy hut so that he can be closer to the miners he preaches to, Van Gogh is a man of passionate extremes. The Season of Migration is an ambitious work, one that I could never write. To blend one's own style with that of a historical figure whose voice is so well known verges on the audacious. I've read Van Gogh's letters to his brother Theo as well as Naifeh's and Smith's biography; yet, I had to look up dates to assure myself that the letters that constitute this book were fabricated. 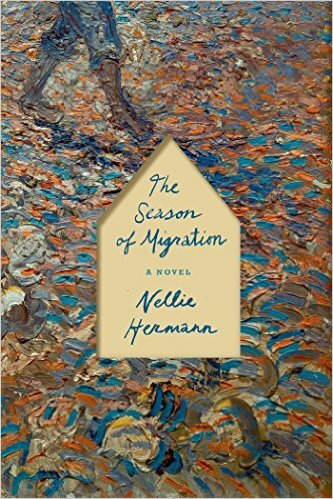 Hermann has chosen to focus on a period in Van Gogh's life where he's still struggling to be like his father, the minister. He travels as a laymen clergy to the Borinage mines in Belgium. I found myself wondering why Hermann chose this particular period of Van Gogh's life to focus on. It was a ten month period when he and his brother broke off all contact, and so carries with it much intrigue and the most room to explore in a fictional account. Hermann wrote in Paris Review that it was the "most significant period of transition in his life." Just when I started to think, Oh her description isn't visual enough, Hermann focuses in on the blackness of the mines. When I think, oh he doesn't observe people the way the real Vincent would, he sees a "woman miner standing at the edge of a crowd." When I think, he isn't angry enough, she writes, "inside his head a dark cloud rolled in, turning all his thoughts to black. His brother had come in bad faith." There are two passages in particular I want to highlight. Vincent has just witnessed the birth of a cow. Vincent stood toward the back of the room, taking in the scene and imagining how it could be painted by Correggio: a black background, the cow illuminated from the center of the image as if from the inside, the moment of the calf's birth like the birth of an angel; or by Millet: an ominous sky, the calf birthed outside in a field, a peasant woman in an apron bending over to receive the animal; or by Israels: the barn rendered in browns the same color as the cow, the peasant girl in the corner with red circles of blush on her cheeks barely visible except if one was to look closely. Hermann does not really focus on Van Gogh as an artist, which is fitting since at this period in his life, he hasn't committed to being one. But passages such as this lend her an authority that helps the reader trust the rest of the narrative. A few nights, I tried to draw her, sitting cross-legged before the hearth; the drawings were never right-- in one she looked anonymous as if she could be any woman at all; in another she was leaning back on her hands and so her front looked like an animal, as if it were unconnected to her arms. None of them captured her. I had to ask her permission, with some humiliation, to try again. Hermann wrote in Paris Review that part of her motivation for writing the novel was that she "was amazed by the power of Vincent's words-- how felt they were." She has indeed captured this quality in her book. This book is a cure for flatness because it fully brings to life a historical figure, immersing itself in his interior world in a completely believable way.